Why the troll problem is actually a culture problem: how online trolling fits comfortably within today's media landscape. Internet trolls live to upset as many people as possible, using all the technical and psychological tools at their disposal. They gleefully whip the media into a frenzy over a fake teen drug crisis; they post offensive messages on Facebook memorial pages, traumatizing grief-stricken friends and family; they use unabashedly racist language and images. They take pleasure in ruining a complete stranger's day and find amusement in their victim's anguish. In short, trolling is the obstacle to a kinder, gentler Internet. To quote a famous Internet meme, trolling is why we can't have nice things online. Or at least that's what we have been led to believe. 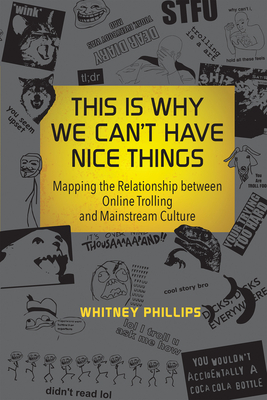 In this provocative book, Whitney Phillips argues that trolling, widely condemned as obscene and deviant, actually fits comfortably within the contemporary media landscape. Trolling may be obscene, but, Phillips argues, it isn't all that deviant. Trolls' actions are born of and fueled by culturally sanctioned impulses--which are just as damaging as the trolls' most disruptive behaviors. Phillips describes, for example, the relationship between trolling and sensationalist corporate media--pointing out that for trolls, exploitation is a leisure activity; for media, it's a business strategy. She shows how trolls, "the grimacing poster children for a socially networked world," align with social media. And she documents how trolls, in addition to parroting media tropes, also offer a grotesque pantomime of dominant cultural tropes, including gendered notions of dominance and success and an ideology of entitlement. We don't just have a trolling problem, Phillips argues; we have a culture problem. This Is Why We Can't Have Nice Things isn't only about trolls; it's about a culture in which trolls thrive. Whitney Phillips is a Lecturer in the Department of Communications at Humboldt State University.